Our hens stopped laying a few weeks ago...or so I thought. Earlier this week as I went about my morning feeding chores, I noticed an egg in the nest and breathed a sigh of relief. "They must have been taking some time off," I thought to myself. They do that time and again. But that evening when I went back to check on them, not only were there no additional eggs, but the one I'd seen earlier was gone. Hmmm. I knew at that moment that either a gopher was getting the eggs or another chicken snake. After inspecting the nest for tale-tale shells which would be left if a gopher were the culprit, there were none. lets you catch fishing minnows from a small creek. The minnows go into the basket to get the bread, and then can't find their way out. It works the same way with snakes. I went back around lunch to fetch some tools from the shed and I almost stepped on a chicken snake by the door of the shed. I acted as if I hadn't seen him and stepped into the shed and got my gloves. I then went out and stepped to the back deck where I hang my walking stick. It has a fork on the very end which I knew would work perfectly for snake duty. 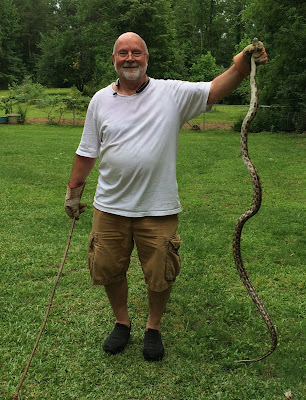 I eased back to the shed and with one swift motion, I trapped the snakes head with the forked stick. After picking that baby up, I called for Jilda to come outside and snap a photo. Holding it up head-high, it's tail reached near the ground and as you can see it was still writhing. I'm 5' 10" so this baby was over six-feet long. I called my buddy Fred who had told me he wanted the snake as a mouse slayer at his house, so I stuffed the snake into a big pretzel jar and relocated that baby to another zip code. Good riddance. This morning I had four eggs in the nest. I'm pleased about two things. Firstly, the egg thief has been caught and secondly it wasn't given a death sentence but has gone to Some Other place to live a more useful life. You're nuts - that is one huge snake. I'm hoping it's not too dangerous to humans? As much as I hate hate hate snakes, I'm glad he went on to a new usual life. You and I are trappers extraordinaire. Wow, ... I'll stick to trapping squirrels. I showed your pic at lunch to my coworkers. We all had the same response..."ahhhh! That's awful!" No snake lovers here! Great shot though! Oh my God. Look at the size of that thing. Thank God no body was bitten. If I had been the one to step on that snake, you would have heard me scream all the way from San Diego to your place. I am not scared by most creatures, just reptiles in most forms. Great photo! What zip code, and did you use FedEx? You might want to put out the trap anyway just in case he wasn't a loner...and damn that is a big snake! You are a great detective. Using your deductive reasoning you figured out who the culprit was and captured him. Congratulations. Exciting account and compassionate conclusion. I'm sure chicken snake will be happy in his new job. That is the longest one I have ever seen! I do like it when they wait on you to get back. I hope the dude stays where there are NO EGGS and doesn't have a GPS to get back. Frogs, birds, and dust bunnies. We borrowed our sky today from San Francisco.